VENICE — Beyond its shops and canals, Venice bestows a fortuity on those who embrace travel done right. Visitors caught in a spontaneous masquerade can feel as if they are frozen in history — or exploring an alien planet. 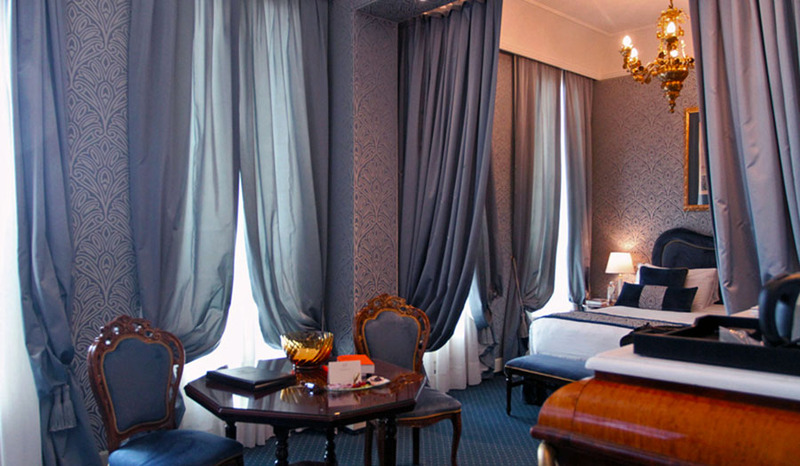 Such experience springs to life while staying at the Hotel Londra Palace in the Castello sestiere, or district. Venice is known as La Serenissima, or most serene. But serenity is difficult to find during high-tourism season, as visitors clamber over bridges and crowd into piazzas. So head east, away from the tourists, and find the calm waters of the Adriatic Sea merging with those of San Marco Basin. The building that is now the Hotel Londra Palace was built in 1853 and was first called the Hotel d’Angleterre & Pension. It later became the Londres and later still the Londra Palace. In its 150+ years of life, the hotel has received luminaries such as Russian composer Pyotr Ilyich Tchaikovsky, Italian writer Gabriele D’Annunzio and Argentinian poet Jorge Luis Borges — whose names appear in the hotel’s register. With its 53 rooms that look out onto San Marco Basin, the Londra Palace is widely regarded as the most Venetian of hotels — a wonderful mixing of extreme luxury with the warmth of a boutique inn. A junior suite creates a calming effect, with richly covered walls, lush carpet and Biedermeier-era furniture. Known for their use of ornate tapestries, velvet-covered furnishings and heavy brocade drapery, artisans of the Biedermeier era (1815-1848) sought to recreate the style and romance of the high Roman Empire. That spirit lives on in the Londra Palace. A comfortable king-size bed features an upholstered headboard and heavy drapes, ensuring a good night’s sleep. Bathrooms are well-appointed with luxe amenities from Ortigia, a small soap and scent shop based in Florence. Ortigia derives its scents from regional plants and spices, and its Ambra Nera collection — offering hints of spice from labdan, an ancient brown resin from the cistus rockrose shrub — is featured at the Londra Palace. Each area of the Londra Palace is designed to stir the emotions and promote well-being. In the refurbished, luminous sitting rooms on the ground floor, the connection with the outside world is enhanced by the use of glass — and bears a reminder of Tchaikovsky’s stay. The Londra Palace rests beyond the tourist-packed San Marco district but is mere steps from St. Mark’s Square, St. Mark’s Basilica and the Doge’s Palace. A monument to Victor Emmanuel II, the first king of Italy, stands regally before the hotel. Getting around is quick and easy: A water taxi operates in front of the hotel, and public water buses are within walking distance. However, the best mode of transportation is to stroll and explore the Castello district. The Riva degli Schiavoni promenade along the San Marco Basin extends to the Venetian Arsenal, a cluster of former shipyards and armories first established in the 1100s. The waterfront walkway is the perfect place to sample aperitifs, take lunch or dinner, drink tea or just relax. This is where Venetians go to get away from the unending crush of tourists. The Ristorante Do Leoni in the Hotel Londra Palace is a temple to Venetian cuisine, thanks to the artistry of Chef Loris Indri, who combines tradition and innovation to create fine dining in an elegant atmosphere. Diners can choose to eat inside or al di fuori beneath the restaurant’s canopy sheltering its front terrace, just a few feet from San Marco Basin. The terrace is surrounded by small white laurel flowers, offering diners a bit of privacy while providing breathtaking views of the basin and the basilica. Dinner consists of one delectable dish from the sea after another, and none disappoints. Chef Indri opens the meal with a surprise — succulent sea scallops with the roe attached. Usually shucked from the mollusk, the roe is a briny delicacy of unparalleled delight and guarantees the scallop is the freshest available. 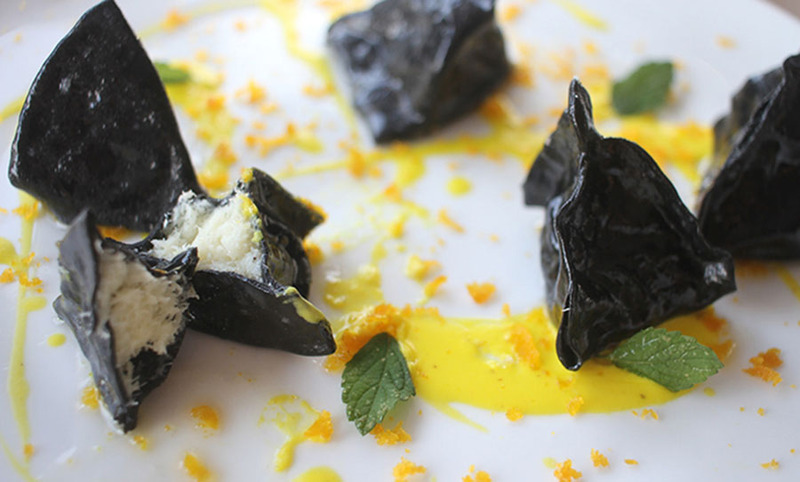 Venetian cuisine with a modern twist is what’s on the menu, evidenced by whitefish in squid ink pasta triangles. Firm, flavorful packets of pasta hold the moist and tasty whitefish, all accented with lemon and mint for a rich and satisfying gift from the sea. A master of seafood and pasta, Chef Indri pays personal homage to Venice and the Adriatic. His creative skill and excellent choice of ingredients make the Ristorante Do Leoni worthy of its Michelin star. What truly makes the Londra Palace and Ristorante Do Leoni special are the people. • Jacquie Kubin is an award-winning travel and food writer and travel editor at Communities Digital News.